It was freezing in NYC this weekend, so when I did venture outside, I made sure to stay bundled up. This coat kept me warm and I love that it’s navy with black piping. I already own a number of black winter coats, so this navy one is a good addition and pairs just as well with the neutrals in my closet. You look gorgeous! I love that coat and your distressed skinnies. Thanks for stopping by! Thank you! These skinnies are some of favorites! The boots are really cute, love how put together the whole outfit is. Thanks! These boots really are the best - they have a heel but are still comfortable! Thank you! These jeans are my faves and are so affordable! 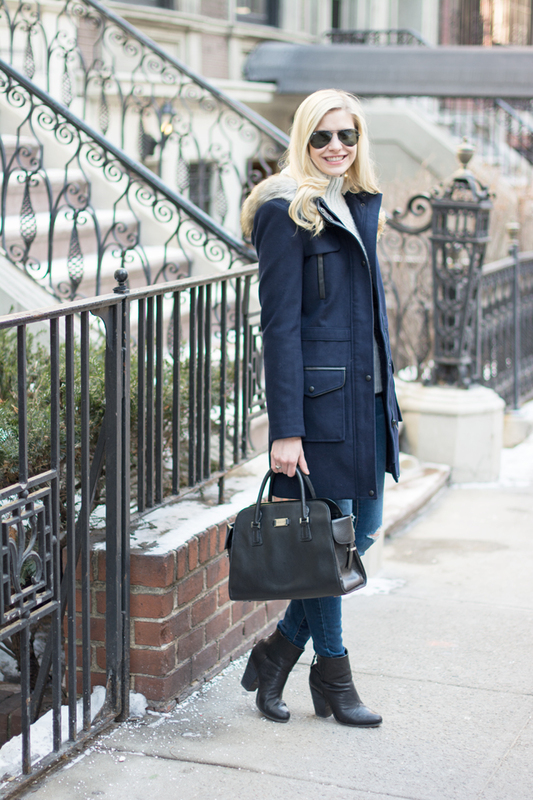 I love this Navy Duffle Coat. Happy Monday, Kayla :) Stay warm! Thanks! I hope you had a fantastic Monday! I love the combination of grey, navy and your blonde hair! This outfit is awesome. I love the coat. It's a classic colour and cut. The little booties are so perfect. too! Thanks! It's really an awesome coat and so warm! I love your cozy sweater and its pastel hue. Great casual winter layered look. Thank you! I am all about the lighter neutrals right now - blush, gray, cream, etc. Thank you! They are definitely on repeat as of late! This is such a cute outfit! The black piping is so cute on that coat and that turtle neck looks so comfy cozy. I had a look at some of your other posts and I love your style Kayla! What a cute way to stay warm! I love the navy coat against the grey turtleneck. In fact, I wouldn't mind having that grey turtleneck in my closet :) It looks so comfy and stylish! obsessed with this coat. I love the fact that it incorporates the black with the navy! This entire outfit is cold weather chic! I really like your coat; it's got a lot of little details that come out when you take a good, hard look. Your hair is pretty much perfect as well. What a chic look! Love those boots and your layers! You look darling! This is the perfect simple and chic combo for the winter! !